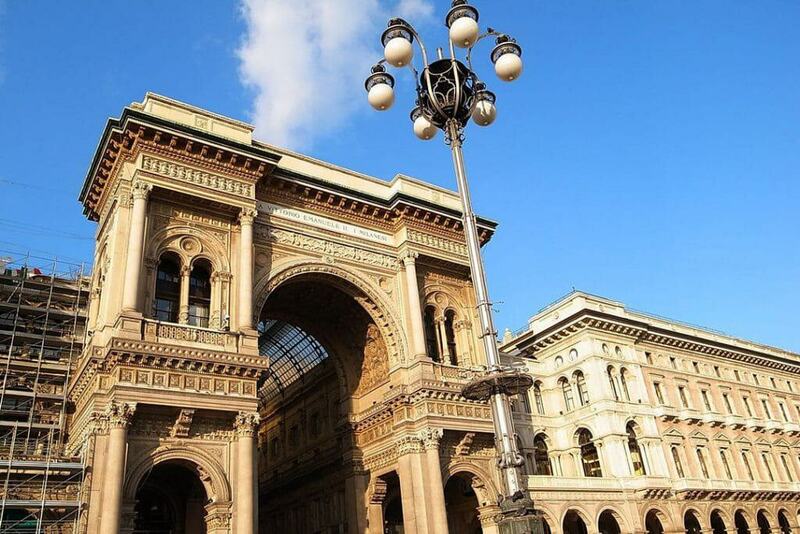 Milan is the Italian fashion capital that you should add to your Italy itinerary. A futuristic metropolis that mixes ancient buildings with modern skyscrapers. It’s the one place in Italy where looking good is mandatory and “aperitivo” after work is a form of art. 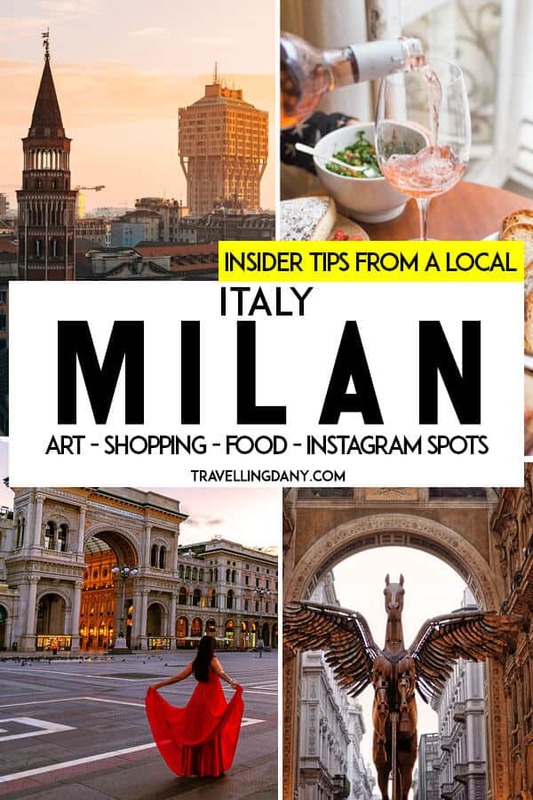 If you only have one day in Milan, then you’ll want to check out this guide with the best things to do, according to a local. My sister has in fact been living in Milan for years and she knows quite well how to enjoy the city, avoiding as much as possible the hugely crowded spots and spending her free time as a true fashionista, between cool spots, the Navigli, the newly built districts and… a cat café where they adopted a bunch of adorable stray cats! Let’s discover together ten quirky, unique spots in Milan you can’t possibly miss! The Duomo Cathedral is probably the most famous highlight in Milan. I remember visiting my sister for the first time years ago, of course opting for a walking tour of Milan. Hopping on the metro over there is always a great idea, because it’s cheap and easy to use, so you won’t necessarily need to rent a car. Yet when I climbed up the stairs at the Duomo station I wasn’t expecting the breathtaking view. A couple of steps out of the metro and you’re exactly in front of this majestic cathedral. The facade is adorned with 135 spires and 3400 statues: it’s enough to make you feel tiny. In 2017 Starbucks planted a few tropical palms in piazza Duomo. It was their way to advertise the future opening but the locals protested harshly against them, to the point that one of the palms was burned by some vandal. Now piazza Duomo is definitely different if compared to the square we’ve seen the first time, but there’s one thing that will always be the same… the crowds. If you want to avoid them, your best bet is to go there early in the morning. If you visit Milan in Winter you might find the Duomo covered in snow, like a fairytale! Yet again… timing is vital. 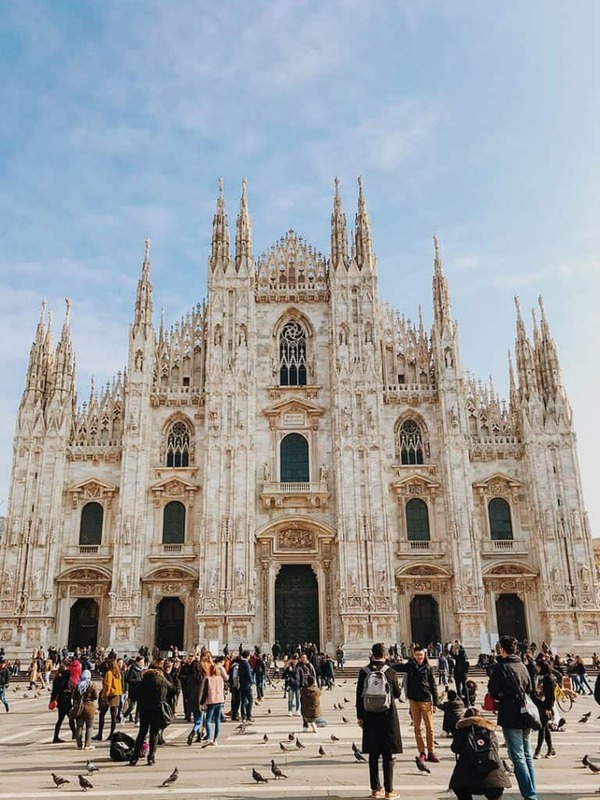 Especially during the Milan Fashion Week, piazza Duomo is one of the favorite backdrops for instagrammers, models and the likes. Absolute madness! Planning to visit Milan in the warmer months? Check out our awesome guide to learn what to wear in Italy and avoid these common travel mistakes! The Cathedral is open every day from 8 am to 7 pm. The last tickets will be sold at 6 pm. You can buy one at the Duomo (no need to do it online) for 3€. Yet it’s absolutely mandatory that you are dressed properly, or they won’t let you in. One summer it was like 40° C and we wanted to visit. I was wearing a proper tank top and believe me, I was melting. Yet I forgot to bring a large scarf with me (honestly, I didn’t even think about a scarf, it was so hot!) and they didn’t bulge: my husband Aldo was welcome, but I couldn’t enter the Duomo. 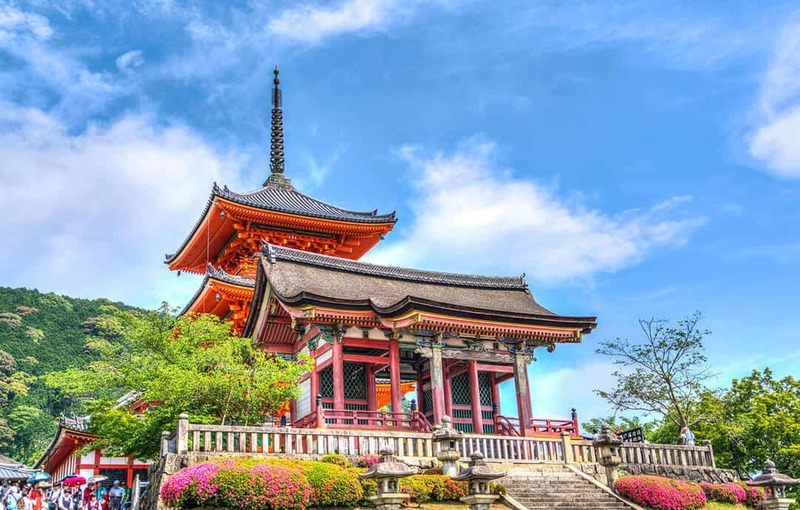 So if you are planning to visit, even if it’s very hot, make sure your legs are covered (no shorts), and bring a scarf in your backpack that you can drape over your shoulders. One of the most instagrammable places in Milan is the Duomo terrace. While the times are the same as the Cathedral (they open one hour later but close at the same time), the tickets cost 9€ if you want to climb the stairs to the top, or 13€ if you prefer to use the elevator. The view from the top is absolutely amazing but then again, if you are planning to take a few good pictures, make sure you go there as soon as they open, because it will get crowded. In case you’re visiting Milan in winter, the Duomo terrace might not be worth a visit unless it’s a very clear day. From piazza Duomo you can also see the Madonnina (Little Madonna), a gilded statue located on the top of the Cathedral. It’s the city’s traditional protector and icon. 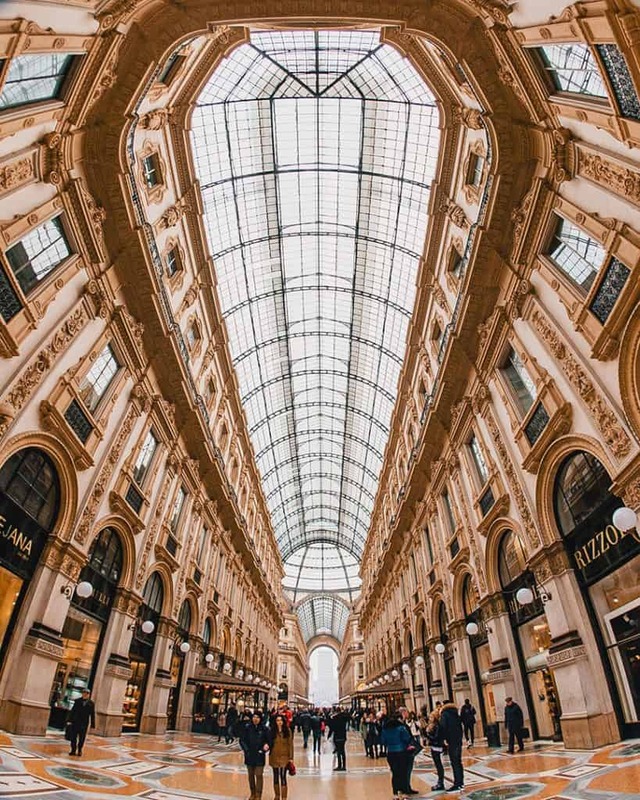 If you have visited Naples already, you’ll immediately notice that… here in the South we have what looks like a copy of the Galleria in Milan. While ours is called Galleria Umberto I, the one in Milan is the Galleria Vittorio Emanuele II. Dedicated to the King Vittorio Emanuele II (obviously), it has always been the place where rich people from Milan gathered to discuss art, politics and literature. The Neo-Renaissance iron-and-glass structure marks the route from Piazza del Duomo to Palazzo Marino and thus the Teatro alla Scala. You can think of it as a… mall from the 19th century! Even today you will find luxury shops, fancy restaurants and good (but expensive) gelato shops. In the past there was also a McDonald’s, but after 20 years of occupancy the restaurant was forced to shut down. The fight between the tenant and McDonald’s was ugly, but the city of Milan won. On its last day there, McDonald’s (which has opened another restaurant nearby) offered free food and drinks to over 5000 customers. Its place was taken by the second Prada store in Milan, that has to adhere to strict rules to preserve the aesthetics of the Galleria. Unless you have a huge bank account, maybe it’s not a good idea to go looking for Italian souvenirs at this Prada store! While it can be particularly crowded, if you followed our suggestion to visit the Duomo early in the morning, then you’ll have a good chance to take nice pictures of the stone arch at the entrance, and the beautiful glass roof, without it being too crowded. The Galleria Vittorio Emanuele II is in fact only a few steps away from the Duomo, so maybe after visiting the Cathedral and its terrace, you can stop here for an espresso or a (pricey but good) gelato. The oldest café in Milan is in fact in this Galleria. It’s Biffi Caffè and it was founded in 1867! I’m sure you can add a little gelato to your Milan walking tour, right? Only make sure you know the tipping rules for Italy! Castello Sforzesco (Sforza Castle) is a red brick castle, built in the XVth century by Francesco Sforza. While so many people abroad think of Duomo when they imagine Milan, here in Italy Castello Sforzesco and the beautiful fountain at its entrance are the most iconic sight of the city. It is very easy to get to Castello Sforzesco using the Milan metro, as you have 3 metro stops all around the castle: Cairoli Castello, Cadorna and Lanza. If you have more time, I suggest you to spend a good part of your day in this area. Castello Sforzesco is in fact located in Parco Sempione. 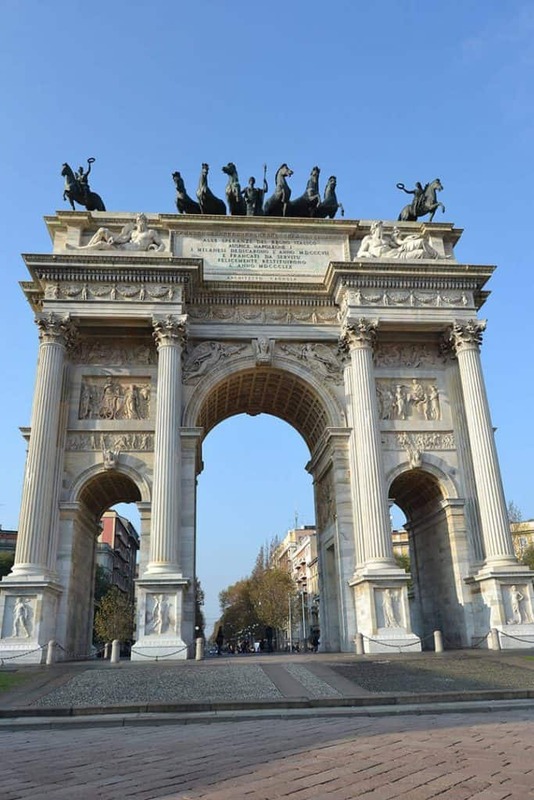 The beautiful gardens are also home to Arco della Pace, the Torre Branca, the famous Triennale di Milano (a design and art museum), an aquarium, and the Gianni Brera Civic Arena. It takes quite some time to visit everything, but let me suggest you to skip the aquarium (it’s tiny and not worth the time) to spend some time walking around the lake located in the center of the park. Plus you won’t have to pay a ticket to do that! Of course if you only have one day in Milan, visiting the whole park isn’t an option so you should stick to the Castello Sforzesco, which houses seven museums. The castle is open every day from 7 am to 7:30 pm, while the museums are open from Tuesday to Sunday, from 9 am to 5:30 pm (you can get in until 5 pm). The ticket to visit all the museums costs 10€. Yet you can enter for free every Tuesday from 2 pm, every other day on the last hour (so from 4:30 pm) and on the first Sunday of every month. One of the most beautiful museums inside the Castello Sforzesco is the Museo d’Arte Antica (museum of Ancient Art), located in the ducal apartments, with frescoes by Leonardo da Vinci. On the first floor you will find the famous Pinacoteca and the Museo dei Mobili (Furniture Museum). Again, plan wisely your time in Milan as you might not be able to visit all the museums! The Last Supper is probably one of the world’s most famous murals. Painted by Leonardo Da Vinci, it’s located on a wall of the refectory near the Basilica di Santa Maria delle Grazie. The 15th century mural portrays the reaction given by each apostle when Jesus said one of them would soon betray him. Each one has a different expression or posture, showing off various degrees of anger or shock. The ticket is quite expensive, because it costs 10€, with 2€ of online booking fee. It has to be bought online, because only groups of max 30 visitors will be allowed to enter. Which is the main reason why you have to book online (making sure you do so well in advance) and you pay a lot. In fact you will be only allowed to visit for 15 minutes, and you won’t be allowed to get in if you are carrying a large backpack or for example a suitcase with you. You can enter for free the first Sunday of every month but you will still have to book your free ticket… unfortunately only calling their call center. Which can be a bit messy unless you speak a decent Italian (in case they don’t speak English) and can use Skype (to avoid paying a lot for your phone call). I won’t lie to you: being so close to The Last Supper is particularly exciting. The mural is amazing seen up close! 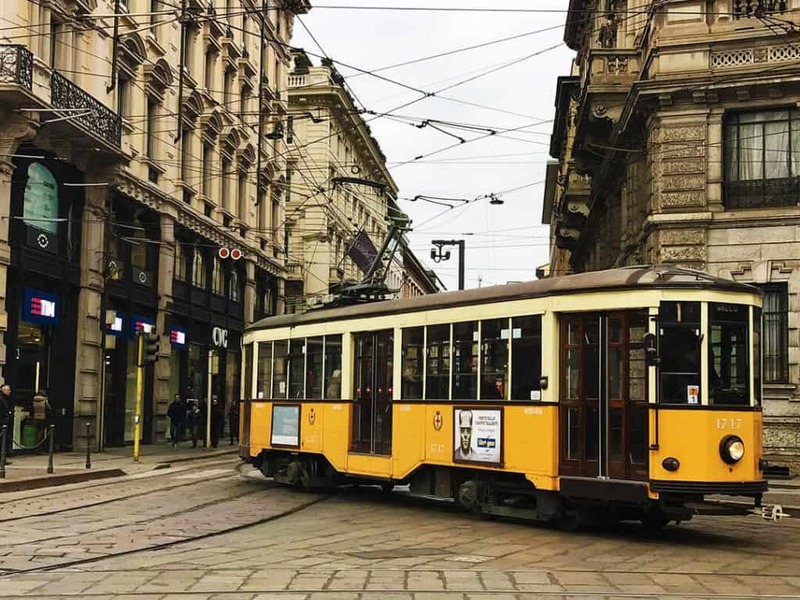 Yet as I already mentioned, there’s only so many things you can do in Milan in one day, so choose wisely what you want to see… also according to your budget! Sant’Ambrogio (St. Ambrose) is Milan’s patron saint. His body was buried in the crypt of this cathedral, which he founded in 379 AD. You have probably seen its beautiful colonnade quite often on Instagram, also for (unfortunately not always tasteful) fashion shoots. Now while the entrance is free and the Church is so beautiful… don’t forget that it is a Church. So you should apply the same rules mentioned for the Duomo. No shorts and cover your shoulders. The inside of the Basilica di Sant’Ambrogio is particularly beautiful. Main highlights are the shimmering altar mosaics and a golden altarpiece which once served as the cladding for St. Ambrose’s sarcophagus. The paintings inside are also a must see. And it’s even more important that you visit because in 1943 this Church was heavily damaged by the English-American bombings: we risked to lose another piece of art and history during a war that caused so much death and destruction. The Basilica di Sant’Ambrogio can definitely be visited also if you only have one day in Milan because it’s pretty close to Parco Sempione and Castello Sforzesco. Yet if you don’t feel like walking, you can get there using the metro (S. Ambrogio station, Green line) or a bus (n. 50, 58 or 94). Also… the entrance is free, so why not? If you are visiting Milan for Christmas, then know that it’s here that they started the “Oh Bej! Oh Bej” markets in 1510 that I already told you about! 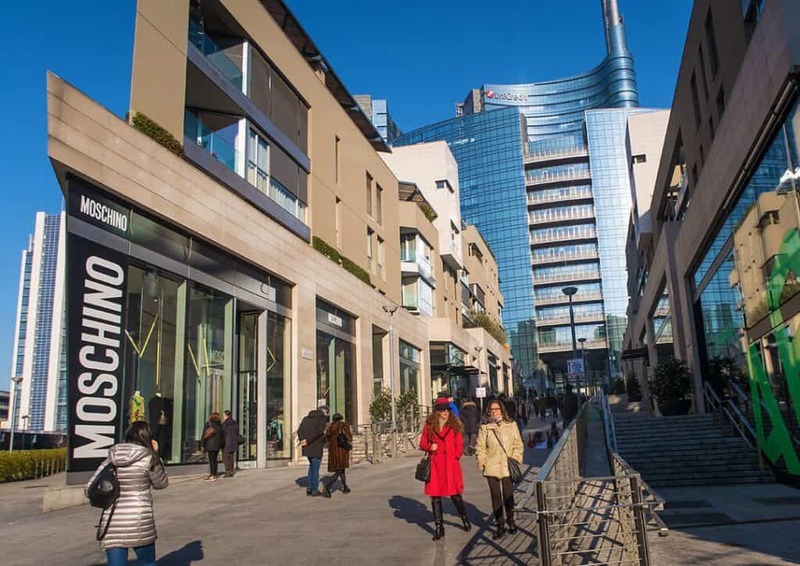 According to the Landscape Institute, Piazza Gae Aulenti is one of the most beautiful squares in the world for its urban development, design and environmental achievements. Finished only in 2012, this is one of the new areas in Milan (you can see it in our video at the top of this page), also labeled as the “futuristic square“. It was designed by Cesar Pelli as a square that had to become a place of social gathering, something clearly stated even by the long sculpture-bench where you can sit, next to a pool. The meaning behind the moving water is that they want people to forget they are in the middle of a busy city and just sit, relax and chat with other people. The view on the Milan skyline from here is absolutely amazing. 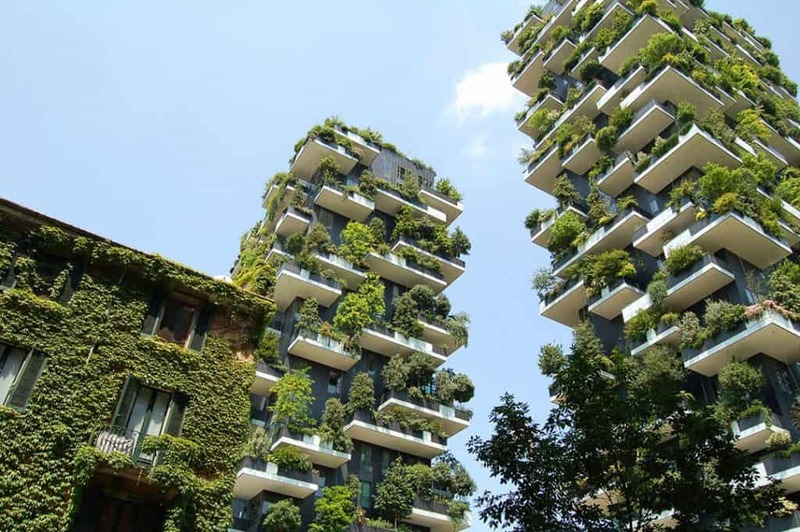 You will be pretty close also to the “Vertical Forest“, two residential towers in the Porta Nuova district completely covered with trees and plants that should mitigate smog and produce oxygen. Piazza Gae Aulenti runs on photovoltaic cells and on the Solar Tree, a metal tree that isn’t just a nice modern sculpture but also another way to reuse the solar energy. If you are visiting Milan in Winter, you will find a nice ice skating rink in this square and quite a few Christmas sales from the shops all around the area. At Piazza Gae Aulenti you will find restaurants, shops and a lot of instagrammable places (also for fashion shots). Getting here is absolutely easy because it’s served by two metro lines (M3, green and M5, liliac), there’s also a train station (Porta Garibaldi) and a few tram stops. Citylife is another urban renovation project in Milan, located where there once was the Fiera Campionaria. As you can see from our video, the area is still a work in progress but it’s mostly finished (they should finish the new buildings between the end of 2018 and the beginning of 2019). It is the biggest pedestrian space in Milan and one of the biggest in Europe, as well as the biggest shopping district in Italy. Cars are to be kept in the parking lots, and people can reach Citylife using the public transport. Once finished, there will be about 5km of cycle paths. The area is a mix of residential, shopping and leisure. With three huge towers designed by Zaha Hadid, Arata Isozaki and Daniel Libeskind and a huge public park, it might make you feel disconnected. Milan? It can’t be! And yet once you’ll see the huge number of shops (especially clothes, shoes and make-up, of course) you’ll remember that you are in the Italian fashion capital! There’s also a futuristic movie theater at Citylife, as well as restaurants, wine and sushi bars, supermarkets… if you are like me you will be forced to set an alarm on your phone or you’ll risk spending too much time there. But if you have only one day in Milan, then you’ve got to be careful. Full disclosure: if my sister doesn’t drag me away every time I am able to spend even the full day shopping and just enjoying myself at Citylife… and I won’t even realize it! Citylife is perfect if you are planning to stop for a while, maybe for lunch. A Milan walking tour can be pretty tiring: you deserve a break! 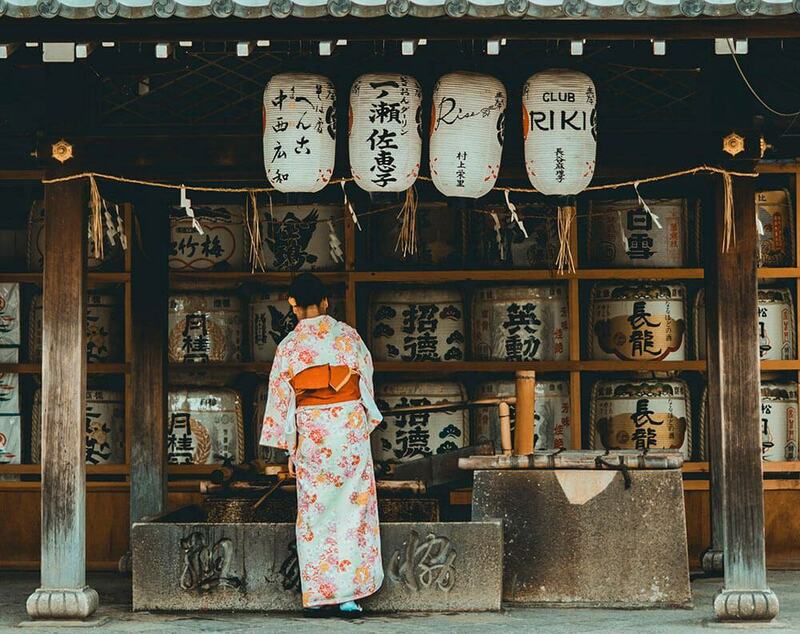 Here you will find also delicious restaurants for every budget, from sushi to cakes, from gelato to a pint of beer. We got to eat very nice piadina here, or amazing meatball dishes for just a few Euros! Of course we can only suggest you to try some traditional Italian food while you’re here, but you really have the chance to eat food from all over the world in Milan. Also make sure you have enough room in your luggage, because I can certify that you absolutely can’t leave Citylife without buying anything (a bit like when I’m shopping in Las Vegas). I’m still pining after a pink flamingo lamp I saw in one of the (amazing) shops there. Aldo told me it wasn’t going to be easy to hop on our plane with an electrical flamingo under my arm and we didn’t have enough space in our luggage. Next time nothing is going to stop me! 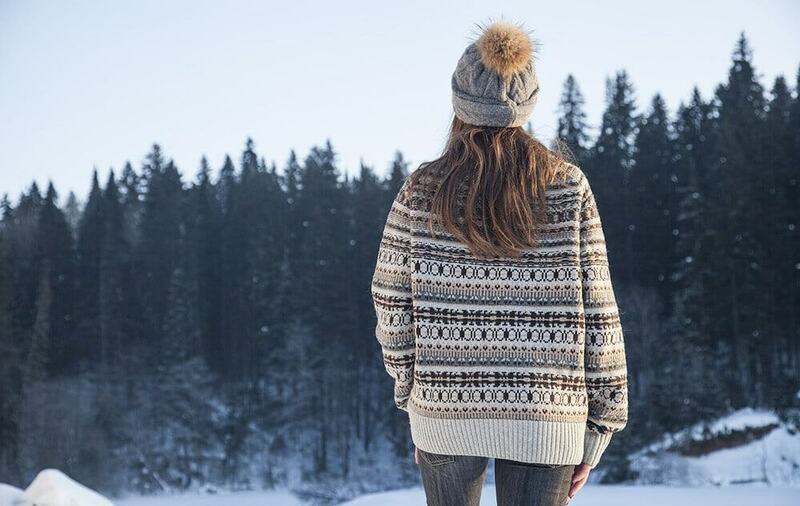 The easiest way to get to Citylife is hopping on a metro (M5, Tre Torri station stops at Citylife, or M1, Amendola station), or you can use a tram (Lines 1, 78, 19 or 68). Once upon a time there was a bunch of stray cats living in the streets of Milan. One day a group of people realized that the Japanese, who have been worshipping cats in their cat cafés since 1998, are geniuses. 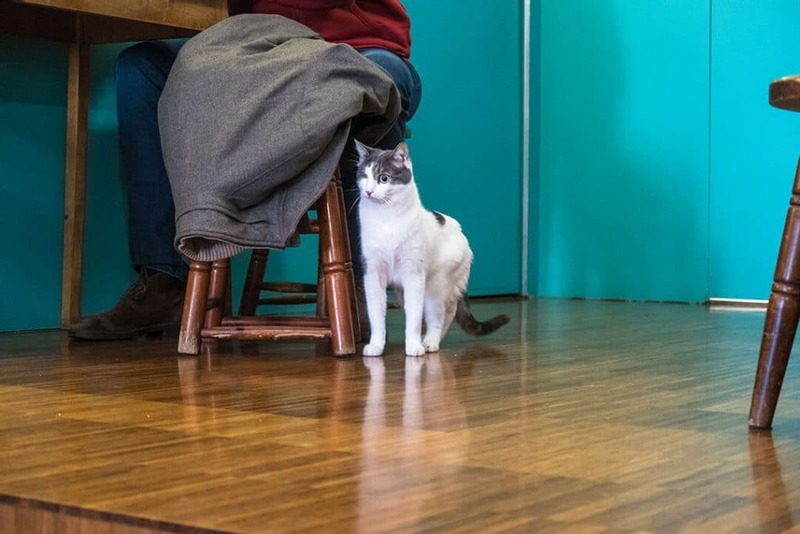 So they adopted nine cats, some saved from the street and some from volunteers, and opened the first cat café in Italy. It’s the Crazy Cat Café. The cats have since become Instagram/Facebook stars, to the point that when I tried to contact the staff to ask to ask a few questions about their cats and the idea behind their café, my message was completely ignored! Probably lost in a ton of fan mail for the cats. If you go as soon as they open you might be lucky enough to play with them when there aren’t too many customers. As you can see from the picture on my blog, one of the furries, Freddie, has lost his eye when he was just a kitten and he’s by far one of the most cuddled cats ever. We have been there a few times and we have noticed that the cats tend to be friendly… to a point. Remember it’s never a good idea to force them to play with you when they’re napping, but the staff is always there to make sure people don’t stress the cats. Once inside you will realize that this cute, tiny café is a place where the animal welfare counts. Not only the cats have lots of toys and can jump everywhere (the kitchen and bathrooms are the only forbidden areas), but there are so many events going on during the year aimed to make people aware on how to adopt stray cats, how to deal with them and how to make sure it’s the right choice, especially when you have kids. Because of this it’s always a good idea to book a table in advance (especially on Sundays as it’s the busiest day) to make sure you won’t go there only to find out they are fully booked! It almost happened to us once, because me and my sister love to have our Sunday breakfast there when I am visiting Milan. So now we always make sure to call first! The Crazy Cat concept is pretty different from the Cat Cafè in Manchester, where kids under 10 years can’t get in and where they have adopted a style much closer to the Japanese cat cafes. The closest station is the Central station in Milan, so metro lines M2 (green) and M3 (yellow). From there you have to walk about 10 minutes to find the Crazy Cat Cafè. If you only have one day in Milan, then you could grab a coffee there before to take the train to the airport, which is what so many tourists from abroad do! Milan is a city where “aperitivo“, the Italian word that indicates a very light brunch to accompany a cocktail (usually we have it before lunch or before dinner), has been taken to a whole new level. It’s common to have aperitivo after work with friends or colleagues. My sister, born and raised in Naples, now finds it absolutely normal to have aperitivo to unwind after a hard day at work. Yet aperitivo in Milan isn’t just a “light brunch”: it becomes an entire dinner made of finger food and deliciousness. There are so many things to do in Milan at night but definitely the Navigli district is the one where everyone wants to go to. Sure, in the summer it can be crazy busy, and you will absolutely have to bring with you some bug repellent because there are mosquitoes this big, but the place is lovely at night. The area surrounding the old canals in Milan is full of tiny restaurants, small cafes, exclusive clubs. 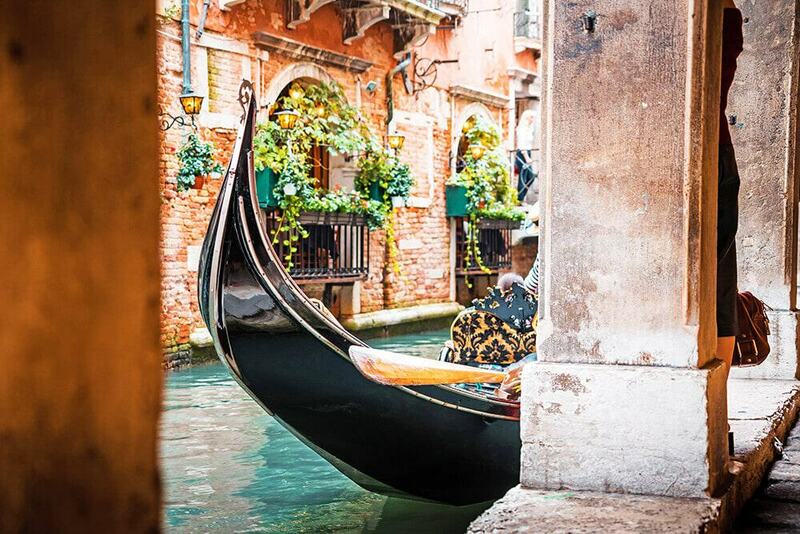 And you can also plan a mini-cruise on the canals. It reminds me a lot of my trip to Amsterdam, only here the cool people of Milan are all concentrated in the same place. I said the cool people, but actually, according to my sister, if you live in Milan you either love or absolutely hate the Navigli district. There’s no in between. The expats living and working in the city love the Navigli in Milan, some of the locals think that they are too noisy and crowded. Some others love the fact that you get to meet new people, find the quirkiest bars and that whenever you go, you’ll always find some company. It’s really up to you. In my opinion, unless you want to go to the theatre (see below), then the Navigli district is one of the things you absolutely have to experience, also if you only have one day in Milan. The Navigli area is easy to reach. Buses, tram or metro (mostly M1, the red line) stop all around the area. Parking is a nightmare especially in the evening so people like to use the public transport to get there. You definitely won’t be alone! Teatro alla Scala in Italy is best known only as “La Scala“. It’s the main opera theatre in Milan and probably one of the most famous in the world. For the past 240 years its stage has seen the finest artists and the greatest plays of all times. The season at Teatro alla Scala generally opens on December 7, to honor Sant’Ambrogio, Milan’s patron saint. All performances must end before midnight so in case of long operas, they start early in the afternoon to be able to finish on time. It’s a place for all the fanatical theatregoers, because walking inside is like stepping into a living art and culture book. Yet know that tickets can be pretty expensive and have to be booked well in advance. Also if you are planning to attend a night of theatre, be aware that there’s a strict dress code that you have to follow. You won’t be allowed inside unless you wear an evening, elegant dress. And you gentlemen will have to wear a suit. People wearing shorts, tops or t-shirts with jeans won’t be allowed inside and tickets won’t be reimbursed! A night at La Scala has to be planned in advance not only because of the tickets, but also because you will need to bring the right clothes (and make sure you won’t crush them in your luggage). Yet it can be a nice way to celebrate something or to treat yourself to a very classy and luxurious experience. Here you can find the most romantic spots in Milan and in Italy, to plan the perfect weekend with your beloved! Will you just stay all 5 days in Milan or move to other parts of Italy? If you are looking for an easy and nice day trip from Milan, I strongly suggest Lake Como, it’s SO beautiful! Have a great trip, I hope you’ll like Italy! I love the mixture of modern and old architecture in Milan. My friend and her husband spent a week in Italy and went to Milan on a day trip. There’s a lovely photo of them in front of the Duomo. The vertical forest looks really cool! I need to visit Milan whenever I return to Italy ? I think most people only think of Duomo when they imagine Milan but the city has been through so much and it’s changing at a fast pace! So if you only have 2-4 hours, and you want to stay close to the city center, what do you recommend? How many steps is it to climb the Duomo? It really depends. Are you coming from the airport? Consider at least 1 hour/1 hour and half to go from the airport to the city center, and the same time to get back. So if you have a layover in Milan, be very careful. With that (very) little time the only thing I can suggest is that you should stick to Duomo, Galleria Vittorio Emanuele II and some shopping in the nearby area. There are 251 steps to climb if you want to reach the Duomo terrace. 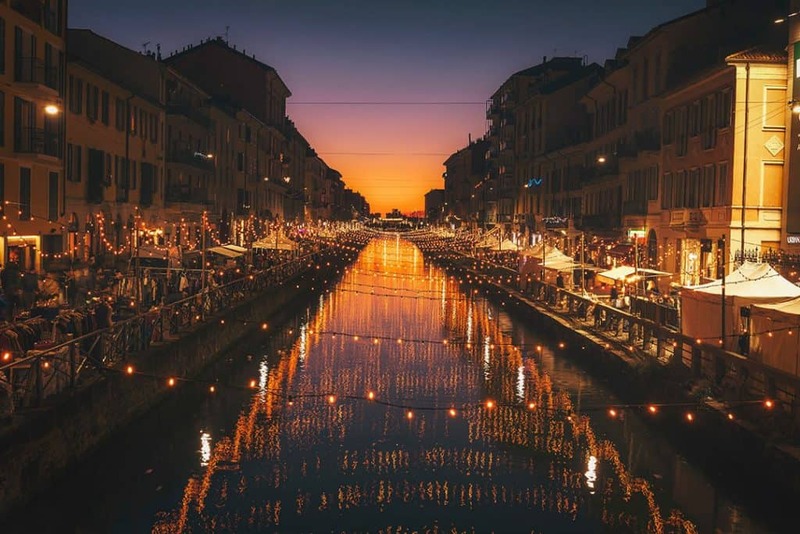 I have never been to Milan before, but the Navigli district looks like somewhere that I would like to spend an evening or two! The vertical forest is something to see! I’d love to see that first. Then the historical sites and then the cat cafe and cuddle wth Freddie! Milan is such a gorgeous city. I love it for its fashion and architecture. The Duomo Cathedral is so intricately beautiful and lavish. And, that explains why it is probably the most famous highlight in Milan. That and the fact that so many people only stop there. 😀 But there’s so much more to see! I would probably go to that cat cafe:) We didn’t have time to see Milan when we were in Italy, but I can see now that was a huge oversight on our part. I think I will skip Rome next time and head to Milan instead. Haha I also always visit cat cafes wherever I am, it’s a fun way to have a nice, cuddly break! We’ve never been to Milan because we both don’t like shopping. But it looks like there’s much more to do and see, so now we really consider spending a weekend there, especially in the Navigli district! Thanks a lot for sharing this! There are so many beautiful places and corners around Milan! The night scene in Navigli is beautiful and you captured it perfectly in your photo! Milan is so beautiful, I didn’t realise quite how nice it was, but now I’m dying to go! It seems like there’s so much to do there as well. I’d love to try an aperitivo! I cannot believe I went to Italy but not to Milan. The duomo cathedral is iconic, one can’t go to Milan and not visit that. But apart from that, there seem to be a lot of other things worth seeing too! I love the architecture of Galleria Vittorio Emanuele II and Navigli looks amazing with its ambient lighting, making it so romantic. I can only imagine how awesome a cruise or dining by the river would be. By the way, your sunset picture near Duomo is breathtaking! I spent three days in Milan and still didn’t make it to a bunch of these places! In fact, Milan is changing so much — I don’t even know if half these places existed when I was there seven years ago. I totally agree with you on aperitivos in Navigli, though. Definitely! They are building more and more new districts, while they renovate the city! I was excited to see this post. We are finally making it to Milan in May. We have more than one day so I can spread your itinerary out a bit. The Duomo and castle are at the top of my list for sure. The vertical forest looks kinda wild! Since I am not really a cat person, I will be passing on the cat cafe! Thanks for including Metro stop information as we usually go by public transit in a city like Milan. Oh wow I’m sure you’ll have a great time in Milan! I love the protests against commercialism with burn palm trees and evicting McDonalds. I’m not sure that opening Prada in its place is a net benefit, but at least they are adhering to the aesthetic rules. I’m also a huge fan of cat cafes. Genius indeed. To me, the whole of Milan looks Instagrammable. I am still laughing – it is mandatory to look good when you visit Milan. Vertical gardens look beautiful and sometimes they give me a sense that this is probably how our future will look like if our population keeps growing the way it is growing. I’m allergic to cats, but there’s no way I could resist that cafe! You’re right, it’s become soooo famous, I see it regularly on social media, but still want to go! What a beautiful city! It has long been on my bucket list, and there are some awesome tips here. Pinning for later, thanks! I love the Navigli District!! Wish I’d known about the castle before I visited Milan, drats. Great post. 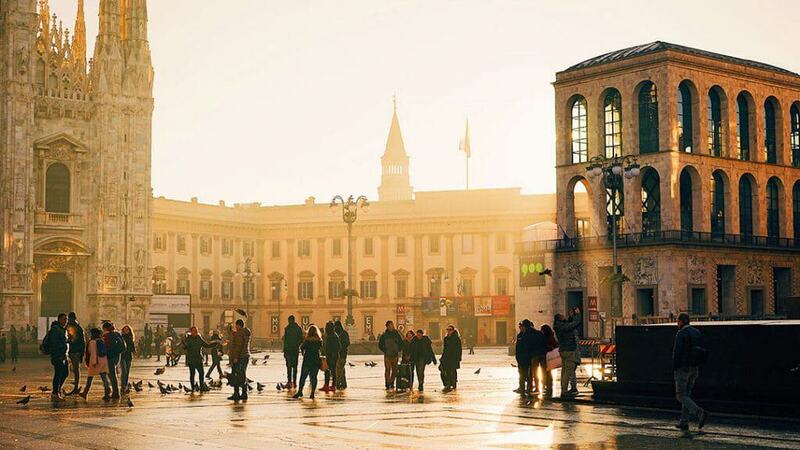 Love the photos of the Duomo at sunset and Navigli. I’ve been a couple of times in Milan for work but been too busy to see any of these beautiful sights – need to make it next time! Oh definitely! You need a trip there, no work, just fun! I love Milan and it was the first place I visited in Italy many moons ago, so reading this post brought back a lot of memories. I remember those pesky pigeons, really hated them in the main square. The only thing I regret is not walking on the cathedral roof. I have a friend who won’t go to Piazza del Duomo because he hates pigeons and over there… gosh there are way too many! Castello Sforzesco has to be one of my favourite attractions in Milan. I haven’t been to Navigli district, but if there’s Aperitivo, it’s got to be a cool spot! It’s one of the best aperitivo spots in Milan! This is my favorite city in Italy! Thank your for sharing all these great spots. 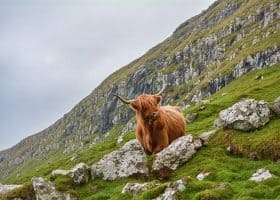 This is a really helpful post for anyone visiting. I’m so glad! When have you visited? Oh yes and taking pictures can be so much of a nightmare! As for the dress code, sometimes it’s just very hot and we don’t think we want to go in a Church, but in Italy they just won’t let you in. 🙁 Which is why it’s better to plan everything before to go!